With there being a fair few franking machines, manufacturers and suppliers to choose from, getting the best franking solution and deal for your business is not as straight forward as you may think. With all the different functions, abilities, terminology and more flying around you may easily get confused and lost in the entire process. Getting the correct franking machine for your business is very very important for both you and the supplier. It can help drastically improve any business mail room and reduce costs across the business. Below we will explore everything you will need to consider when looking for your ideal franking machine. What Mail Do You Send? First things first, you will need to work out how much mail you send out each day and what types of mail you send out. This includes letters, large letters, small parcels etc. The reason behind this is that it will give you an idea of whether or not a franking machine will actually benefit your business and what franking machine will best suit you. Whilst accessing your mailing volume and the types of mail you send, your business should factor in any potential future increases or decreases in the mail volume you send. This is to ensure you are covered both now and in the future. There are three types of volumes you can choose from. These are low volume, medium volume and high volume. – Low volume – these franking machines are ideal for any small business that processes smaller volumes mail on a daily basis. They are compact and easy to use. If you process between 20 and 199 items per day, this could be your ideal machine. – Medium Volume – these franking machines are ideal for any business that franks more mail. They tend to come with automatic feeders, faster mailing speeds and more advanced features. If you process between 200 and 500 items per day, this could be your ideal machine. – High Volume – these franking machines are ideal for dealing with much larger volumes of mail. They come with fully automatic feeders, much faster mailing speeds, dynamic weighing scales for mixed mail processing and offer a wide array of extra functions and features that other machines simply do not. If you process up to or over 1000 items per day, this could be your ideal machine. What Technology Features Do You Require? Once you know how much mail you send on a daily basis, you can now start to think of the features and abilities you wish the franking machine to possess. Various technologies and features will add value to franking and make it even more worthwhile. But there are two that are an absolute must – Mailmark technology and Smart technology. All modern franking machines now come with both Mailmark and Smart Meter technologies as standard. But what exactly are they you may wonder? Mailmark is the latest technology, released in 2014, and this offers a new way of franking. It replaces the traditional ‘crown and die’ with a 2D barcode impression whilst offering users even lower franking rates. View our Mailmark franking web page here to find out more. In addition to Mailmark, you can also access Smart Meter technology. This technology gives franking machines the ability to identify and calculate VAT on many franked products. The VAT information will be saved onto the machine whilst you frank as normal. As the VAT is automatically recorded you are able to reclaim it at a later date. View our Smart Meter franking web page here to find out more. 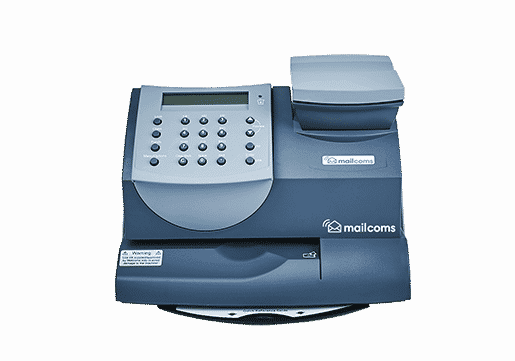 At Mailcoms all our franking machines come with both Mailmark and Smart Meter technologies. View our range of franking machines here. The next step is choosing the best and most convenient way for you to have the franking machine. This will ultimately depend on your specific business needs. Purchasing the franking machine may be expensive at first but it will provide your business with the freedom to do as you wish as you own the franking machine. However when it comes to upgrading the franking machine the cost may be more in comparison to renting or leasing. Renting the franking machine means you will pay monthly instalments. The benefits are that you can rent any machine that meets your needs and at the end of each month you can return the franking machine or change your agreement. Renting a franking machine however usually comes without the maintenance and service agreement which can result in costly maintenance fees. Leasing the franking machine means you pay a fraction of the overall fee upfront with ongoing monthly instalments then to follow. Included in the lease will usually be a maintenance and support agreement. Lease terms are fixed for a period of time and require you to pay for the entire period of time. When your lease period is up, your supplier will offer you an upgrade. Now that you have got ideas of your mail volumes, the features you require and how you wish to pay, the last thing to do is choose your franking machine supplier. Here you may need to compare suppliers and your options in order for you to get the best price and service available. Remember a good price might not necessarily mean a good deal! Also you will ultimately want to work with a franking machine supplier that can provide you with high quality franking solutions, and also high quality customer service. Here at Mailcoms we are a Royal Mail Authorised Independent Inspector & Maintainer Of Franking Machines in the UK. Mailcoms also prides itself on a more personal level of customer service and are proud of some of the kind words left on our Trustpilot page. View our reviews here.